Dean Herzberg, a former Paynesville resident, has received some national spotlight because of an encounter with a dog. 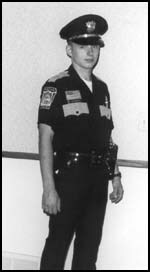 Herzberg, the son of Stan and Marcia Herzberg, Paynesville, is a police officer in Watertown, S.D. The car owner parked the car in the lot, turned it off, and headed into the store’s cafe section for breakfast. Somehow the dog got it out of gear,” Herzberg said. “The animal got the car’s transmission lever from park to neutral and there the car went. The vehicle rolled into a brand new Watertown car. Herzberg’s investigation showed no damage at all to either vehicle, not even a scratch. As a result, the names of the dog and car owners involved aren’t on the record. All that’s left is a note on the Watertown police log and a chuckle from Police Chief Terry Lohr that somehow charges of driving without a license should be forth coming. Public opinion carried the “cute” story which was picked up by Associated Press nationwide. Since the accident, Herzberg has been interviewed live on a Rochester, N.Y. radio station and a Chicago radio station. When the phone rang at his home, Herzberg thought a telemarketer was calling. “I just about hung up the phone. Instead, while his wife, Amy, grinned at the call, Herzberg told the tale of the smart but unlucky driving dog and answered questions ranging from whether the dog was arrested for driving without a license or with fleas—and whether he had problems getting paw prints. “We talked about ten minutes,” Herzberg said, adding the station probably figured he’d be somebody with a good sense of humor from reading the newspaper story. “I’ve been teased about not arresting the dog for driving without a license ever since the incident,” Herzberg said.